Get directions via OpenStreetMap, Google Maps or Mapquest. There are four main car parks in Romsey: Crossfield Hall, Broadwater Road (the bus station), Alma Road and Lortemore Place. 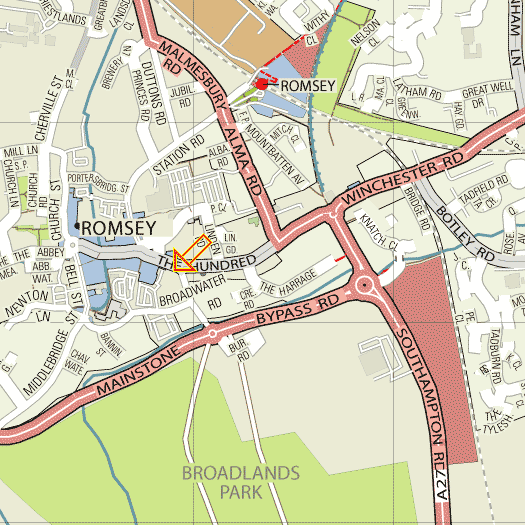 Broadwater Road is a short-stay car park, so only use it if you’re planning to be in Romsey for less than 2 hours. For Crossfield Hall car park, turn off the bypass onto Palmerston Street and then turn left onto Broadwater Road, then first left to Crossfield Hall. Once you’ve parked, walk back to Palmerston Road and turn left at Prezzo restaurant. Once you reach The Hundred, turn left and you’ll see us on your left. For Broadwater Road car park, turn off the bypass onto Palmerston Street and then turn left onto Broadwater Road, then right at the roundabout by Pampurred Pets Broadwater Road car park. Once you’ve parked, go to the north-eastern corner and walk down the passageway between Aldi and Natraj restaurant to reach The Hundred. Then turn right, and you’ll reach us after 100 yards. For Alma Road car park, turn off Alma Road at the entrance signposted Waitrose, then take the first left into the council car park. (There is also the Waitrose car park further on, where you can park for free if you’ll be shopping at Waitrose.) Once you’ve parked, go to the southern end by The Old House At Home pub and walk down Linden Road. 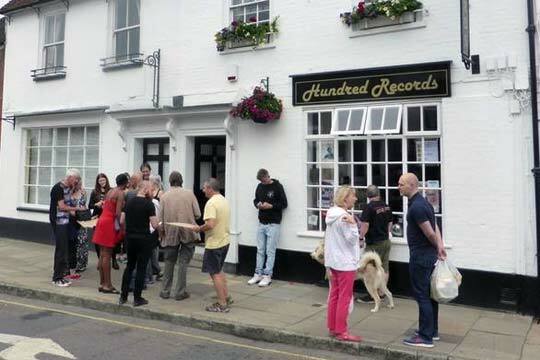 Turn right at the end and walk along The Hundred for 100 yards and you’ll see us on the other side of the road. For Lortemore Place car park, turn from Alma Road into Station Road by the entrance to the station. After passing Portersbridge Street on your right, where the road becomes Latimer Street, turn right into Lortemore Place and immediately left into the car park. Once you’ve parked, continue down Latimer Street and turn left onto The Hundred, where you’ll find us on your right after 100 yards. Romsey has good rail connections throughout the south-west: with Southampton, Salisbury, and further afield, Fareham and Portsmouth, Bath, Bristol and Exeter. Use the National Rail journey planner to find your best route. From Romsey station, walk straight across Alma Road onto Station Road and continue along, bearing round to the right until the road becomes Latimer Street. Continue to the end and turn left onto The Hundred, where you’ll find us on your right after 100 yards. Romsey has good bus connections from many local towns and cities. From Southampton take route 4 (every 30 minutes), or from Winchester route 66 (every 30 minutes) to Romsey bus station. Go to the north-eastern corner of the bus station and walk down the passageway between Aldi and Natraj restaurant to reach The Hundred. Then turn right, and you’ll reach us after 100 yards. Got a question? Just fill in the form and we’ll do our best to help. Make sure to give us your name and email address so we can reply to you.